Paramount International School celebrated Gandhi Jayanti, Lal Bahadur Shastri Jayanti, and Dusshera by conducting a special Assembly. A teacher’s talk on the principles advocated by Gandhiji and Lal Bahadur Shastri enlightened the students about their relevance in today’s world. A brief talk on the significance of Dusshera once again highlighted the victory of Good over Evil. Mrs. R.L. Saroha (M.D.) encouraged the students to be a part of the Swach Bharat Abhiyaan by maintaining cleanliness and hygiene in their class, school, on roads, in their houses etc. A mesmerizing dance performance on the virtuous Lord Rama won a thunderous applaud. The kindergarten section presented an interesting tableau on the life of Lord Rama, the banishment of 14 years and his forest tenure of Lord Rama. Thereafter, the students took a pledge to participate in the Swach Bharat Abhiyaan and the students of class X began cleaning the school ground to set an example for the other students. Their slogan was – why wait for tomorrow when it can be done today. The students of class I and II went on a Clean Your City Rally sporting motivational Head Gears and cleaned the roads whole heartedly. This was followed by another rally by the students of class VII and VIII who cleaned the surrounding areas of Sector-23 market and societies. The Management Committee of the School motivated the entire Paramount family to take initiative and join the ‘Swachh Bharat Abhiyan‘, which was positively implemented by taking brooms and garbage bags and cleaning all the roads surrounding the school and the Sector-23 market. 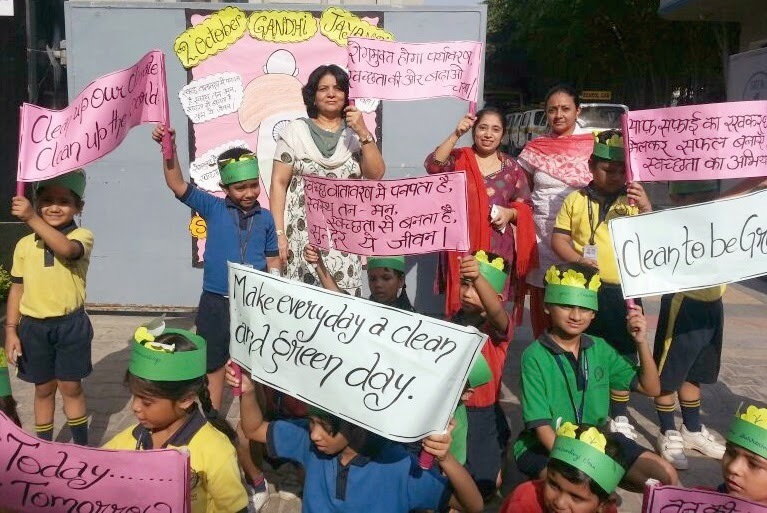 The audio promoting Swach Bharat Abhiyaan motivated the students to keep their surroundings neat and clean and to participate in the campaign whole heartedly.